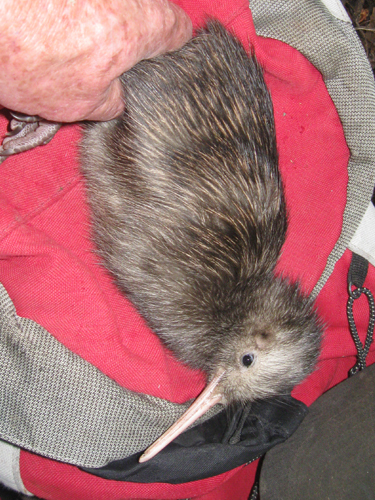 Darwin was released at Mt Manaia as a mature adult in 2006. He quickly headed north, first to a scrub area at Kerr Road and then further north to a pine plantation at Campbell Road. After cruising around for a couple months he set up home at Lamb Road (the road behind the garage at Parua Bay Village). He has stayed there ever since, for 5 years by himself, fat and happy but not breeding. In 2011 he teamed up with a local girl and had a successful nest. They have now successfully hatched 7 chicks. These chicks have been the catalyst for increased stoat trapping in the area through Lamb Road Landcare. One of his chicks “James” travelled 4km westwards to Owhiwa Road where unfortunately he was found drowned in a buried cattle trough at 10 months old. 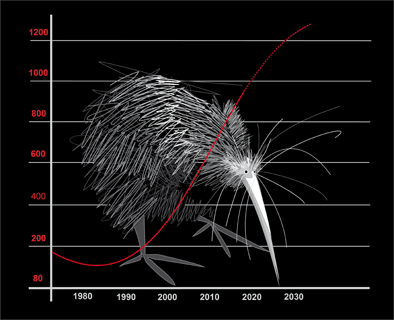 James is an example of kiwi expanding out of Backyard kiwi area into the wider “Kiwi Coast” area. At Lamb road, in bush south of the quarry, feeding up after nesting. 11 hours nightly activity. At Lamb road, hatched two chicks in the pampas at the quarry. There was a big gap between hatches and I had to wait 26 days after the first hatch until Darwin’s activity showed that he had finished nesting. Luckily the old chick was still there. Shaun and family have named them Alison and Connor. Dad was down to 1950 g in weight and looking hungry. At Lamb road, still nesting hard in the pampas at the quarry (1.5 hours nightly activity only). 82 days nesting today and he hatched his first chick 18 days ago by his data stream, but I’m still waiting for his activity to go up after the second egg hatches before checking him. At Lamb road, he has re-nested in the pampas at the quarry – 41 days nesting on 20/12/18 and 1.5 hours nightly activity. Hatch due mid – Jan.
At Lamb road, he has re-nested in the pampas at the quarry – 14 days in on 23/11/18 and 3.5 hours activity. At Lamb road, has finished nesting and moved back to the quarry pampas. At Lamb road, nesting in a hollow puriri tree in the bush just south of the quarry. 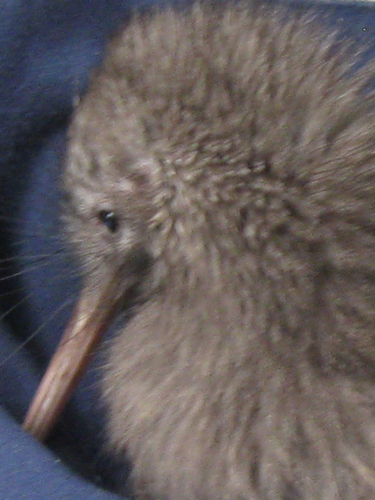 He has hatched one chick – Parua Bay School have named it “Kopu”. At Lamb road, Nesting in a hollow puriri tree in the bush just south of the quarry. His nightly activity was 2.5 hours per night at day 41 of nesting which is good. Hatch is due late September. At Lamb road, nesting in a hollow puriri tree in the bush just south of the quarry. His nightly activity was 3 hours per night at day 11 of nesting which is good. At Lamb road, in the bush just south of the quarry. His nightly activity has dropped slightly to 10 hours. At Lamb road, in the bush just south of the quarry. His nightly activity is 12 hours. At Lamb road, quarry. I did his annual transmitter change and we took the opportunity to film him as part of the videoing that Heather has been coordinating to produce videos about BYK. Darwin was with his mate (Mrs D) – a wild girl only seen on trail cam before. 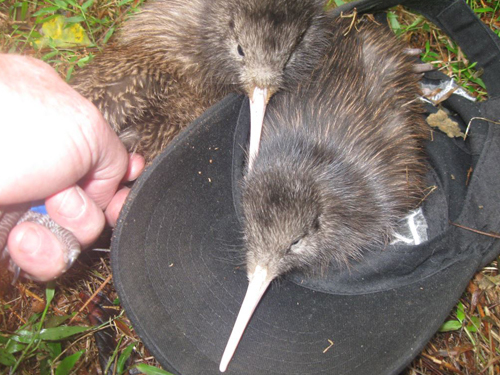 She has a huge bill – 157mm which is the longest ever measured on a Northland brown kiwi. As noted already this old man has moved from the quarry to the edge of Lamb road opposite to where Ross the released male had settled for a while – probably to exert his claim for the territory. After finishing his second nest he has moved away from the quarry and up Lamb road towards the village. 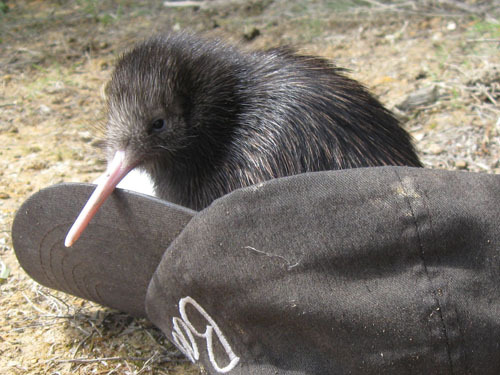 He will be one of the first kiwi calling to welcome the released kiwi next week. At the Lamb road quarry. He has finished his second nest, a nest check showed that he had hatched one egg (shell and membrane present) but no sign of the chick, the second egg was rotten which is becoming a bit of a theme with the wet warm weather! At the Lamb road quarry. 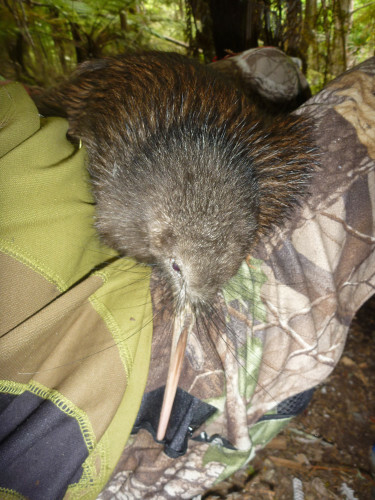 His recent chick was named “Boomer” by Parua Bay School. Darwin is nesting again already and was 5 days into his 80 day stint today. At the Lamb road quarry. Has finished his nest there after a 85 day stint hatching two chicks. The older chick stayed in and around the nest for at least 26 days which is longer than usual. At the Lamb road quarry nesting in pampas. He has now hatched 2 chicks, the 1st at day 61 and a big gap until day 79 for the 2nd hatch. 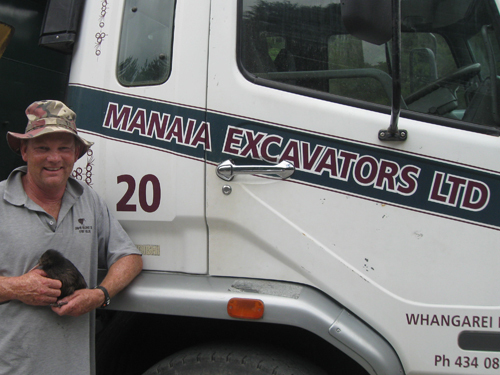 The older chick is named Leo – after the late Leo Robertson who was a proud supporter of Backyard Kiwi for many years through Manaia Excavators. At the Lamb road quarry nesting in pampas. 35 days nesting 25/8/17. His activity is around 2 hours per night but he had several nights of not leaving the nest at all. At the Lamb road quarry in pampas. 11 days nesting 1/8/17 and his activity is down to 4 hours per night. At the Lamb road quarry. His activity is still 12 hours per night. Has moved back to the quarry. Did his annual transmitter change. He was in good condition ready for breeding season at 2270g. His activity is still 12 hours per night. Unfortunately one of his recent chicks turned up drowned in a pool. The chick was only 3.5 months old but had already grown to 910g – not far short of the magic 1000g where she could fight of a stoat. This is a very high growth rate, probably because of the wet autumn meaning she had plenty of food. We knew it was Darwin’s chick because I had ID chipped it at the nest. Has moved away from quarry to bush beside Lamb road. High activity -11.5 hours/night. Usual area Lamb road quarry. High activity. Usual area Lamb road quarry. Renested in pampas bush 5m from Manaia Excavators truck yard. Hatch due late January. Usual area Lamb road quarry. Activity is lowish at 7.5 hours a night so it looks like he is renesting. Has finished nesting –he really put his back into it and was still in the same pampas bush over a month after hatching the first chick. I had a trial camera on the nest that took hundreds of 30 second videos of the activity there. Heather Hunt and Mereana Wilkie have taken that footage and skilfully created a short video story of Darwin’s nest- Have a look, it is pretty cool. Nesting in pampas at Lamb Road quarry. After 78 days nesting he had hatched two chicks. I DNA sampled and ID chipped the chicks. Both are girls by their bill size: 310g and 47.7mm, 46.5mm and 290g. A trail camera set near the nest got some fantastic footage of the chicks feeding, dad coming and going for his nightly break and mum wandering past sometimes. Heather is planning to use the shots to make a video story for BYK. I took the opportunity to do Darwin’s 6 monthly band change and he was healthy but has lost at bit of weight as is expected after nesting. Nesting in pampas at Lamb Road quarry. Nightly activity is a good low 2.5 hours after 51 days nesting. Hatch is due mid-September. In pampas at Lamb Road. Activity slowly dropping so may be starting to nest. In pampas at Lamb Road. 12 hours activity per night. In pampas at Lamb Road. 12 hours activity. In pampas at Lamb Road. 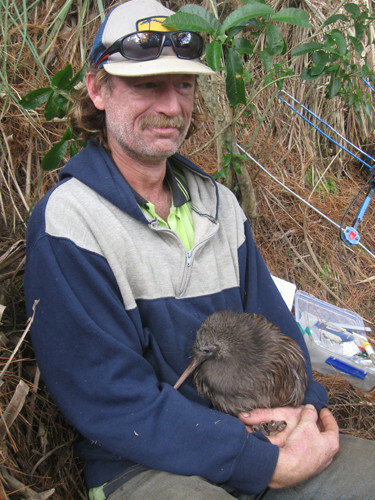 Bernie and Ian gave me a hand to do his transmitter change – he was a healthy 2300g in weight. His nest in the pampas at the Lamb road quarry failed after 60 days, which is unusual. Usually if a nest gets that close to hatching (at around 70 days) things are looking pretty good. I couldn’t locate the nest in dense pampas so am unsure of what happened. On his second nest of the season in the pampas at the Lamb road quarry. He had done 52 days on 26 Feb and had a good low nesting activity of 150 minutes per night. In the pampas at Lamb road quarry. He has renested – up to 30 days nesting on 4/2/16 and 110 minutes activity per night – which is good and low for nesting. Paura Bay School named his recently hatched chicks “Rocky” and “Rusty”. Darwin is now feeding up in the pampas at Lamb Road quarry recovering from his nest efforts. At Lamb Road quarry. He has hatched 2 chicks, his nest was in a pampas bush in an old dump area and had a sheet of corrugated iron for a roof keeping him super dry for the last 3 months. By the time I could safely go into his nest his first chick had moved on (it had hatched 35 days before) but I managed to catch up with Darwin and his second chick who Parua Bay School are going to name. At Lamb Road quarry. He has hatched 2 chicks and has just about finished nesting. We have got some good video of mum, dad and the chicks, all separately, from a nearby trial camera – Heather is will edit this for a website video. At Lamb Road quarry. As suspected he has started nesting with 2 hours nightly activity at day 34. Hatch is due late October. At Lamb Road quarry. 8.5 hours nightly activity, down slightly so may be looking at nesting. At Lamb Road quarry. 9 hours nightly activity, down from 11.5 hours so may be looking at nesting. At Lamb Road quarry. 11.5 hours nightly activity. At Lamb Road quarry. 12 hours activity. At Lamb Road quarry. 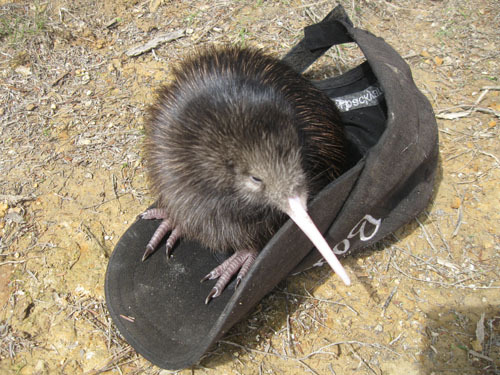 He has finished nesting. He hatched the 1st chick “Murdoch” after 64 days but his second egg was a dud. I did his annual transmitter change – he was 2050g in weight. At Lamb Road quarry. Nesting in the pampas there, he hatched 1st chick after 64 days – it has been ID chipped and DNA sampled. At 11 days old he was 275g and has been named Murdoch by Lamb Road locals, in honour of Murdoch Ross. Darwin is still on a second egg which should be hatching any day now..
Nesting in the pampas at Lamb Road quarry. Hatch is due late February. In pampas at Lamb Road quarry, feeding up after nesting. Activity 9 hours per night. Finished nesting in the pampas at the Lamb Road quarry. 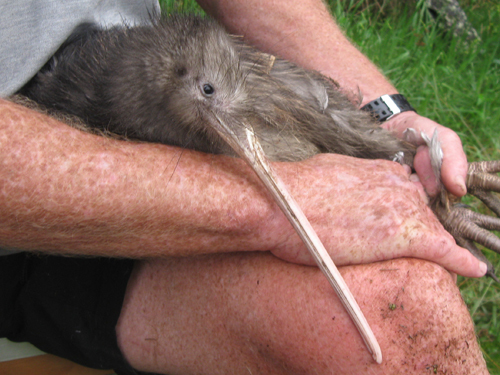 He hatched 2 chicks named “Frank” and “Harold” after Frank Lamb who recently passed away. Both these chicks had feather samples taken for DNA records and ID chips inserted before going back into the nest with Darwin. Nesting in pampas at Lamb Road quarry. He hatched his 1st chick after 69 days nesting on the 26 September. This chick is named “Frank” after Frank Lamb who recently passed away. I will monitor him to see if there is a second hatch. 29/7/14. Activity is good and low for 10 days nesting at 4 hours. Usual area at Lamb Road, high activity. He went for a wander but is back at the Lamb Road quarry. His activity is high – 12.5 hours per night. In pampas at Lamb Road quarry – did his annual transmitter change change, now CT 78. He was a healthy pre-breeding weight of 2250g, and his activity is high at 12 hours per night. Was nesting at Lamb Road quarry but the nest failed and his activity has increased again. Nesting at Lamb Road quarry. At Lamb Road quarry in the pampas – high activity. Has moved back to the Lamb Road quarry in the pampas. Was nesting at Lamb Road but the nest failed after approximately 60 days. Did his six monthly transmitter band change while there was Bittern booming away beside him in the wetland at Lamb Road. He is nesting at Lamb Road. 3 hours nightly activity – nest will reach 65 days approx 27 October. In the Lamb Road quarry. His nightly activity is varying a bit but still high – 11 hours nightly. In the Lamb Road quarry – activity of 11 hours per night. In the Lamb Road quarry – false alarm on him starting to nest last month as his activity has increased. Back in the pampas in the Lamb Road quarry – his activity has dropped a bit and he may be starting to nest. After Darwin left his nest I DNA sampled and ID chipped his recently hatched chick – he was named “James” by the landowners at Lamb Road. No second egg in nest. 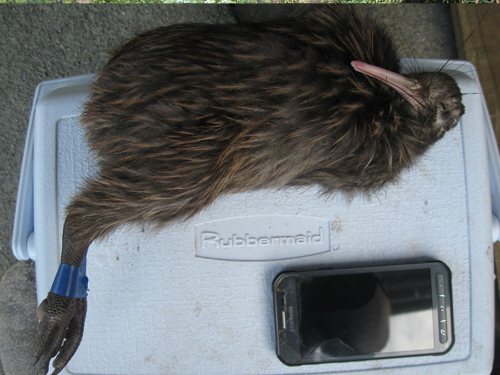 After multiple unsuccessful visits to the pampas in the Lamb Road quarry I finally caught up with Darwin in the wetland beside the road for his annual transmitter change, he was in good condition and weighed 2005g. Nesting in pampas at Lamb Road – 1st chick has hatched. Now waiting on his activity to increase before doing transmitter change on Dad. to hatch in late Feb.